The Shazam! TV trailer features young Billy Batson transforming into the titular hero. Warner Bros. has released the latest look at the movie, which is mostly new footage, ahead of a full trailer. An exact date has yet to be revealed, but it’s believed that the trailer will drop sometime next week, with some hinting that Tuesday is the day. The studio is definitely playing off of the fun success of Aquaman in the latest teaser, a strategy that seems to be working out really well for them. When the Shazam! movie was first announced, it was compared to the Tom Hanks classic Big, and from the recently released promotional material, one can easily see why. Young Billy Batson is given the power to turn into the superhero, which means that he’s physically an adult with superpowers, and can technically purchase beer, as we see in the latest teaser. While we haven’t seen a ton of footage from the movie, Zachary Levi looks like he was the perfect choice to take on the role. The Shazam! teaser is nearly a minute long and showcases some footage that we have seen before, but seeing Billy Batson turn into Shazam is brand-new and it looks pretty rad. Elsewhere, we are treated to a closer look at the powers of Dr. Sivana and a humorous scene where Shazam and Freddy Freeman are hunting for a superhero lair with the help of a real estate agent. Davide Sandberg seems to have made what looks like the perfect blend of family comedy and superhero movie rolled into some darker elements. While Shazam! doesn’t seem to be poised to join the $1 billion club with the likes of Aquaman and Infinity War, it looks like it will be a lot of fun, which is the point. David Sandberg and Zachary Levi aren’t hiding what the movie is supposed to be about, instead, they have let us know from the start what the tone of the project is and either fans are going to be on board, or they’re not. For those looking to get away from the seriousness of the Dark Knight trilogy and Justice League, Shazam! looks perfect. Shazam! hits theaters on April 5th, which is almost a month after Captain Marvel and a few weeks before Avengers: Endgame. All three movies look to be completely different from each other and means that superhero fans are going to have to save their pennies in order to go see all three movies within a few weeks of each other. Some will argue superhero fatigue, but for fans, April just might be the best month of the year with a whole bunch of projects to choose from. 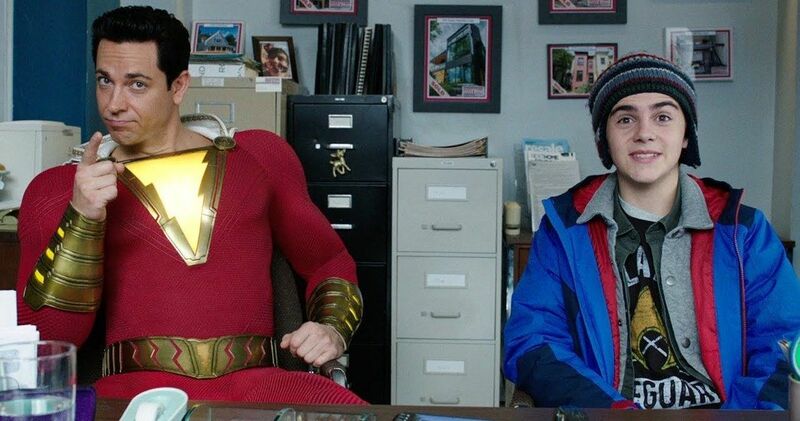 While we wait for the new Shazam! trailer, you can watch the latest teaser below, thanks to the Warner Bros. Pictures YouTube channel.